Athlyn Green is an avid crocheter and knitter. She designs and sells handcrafted goods. 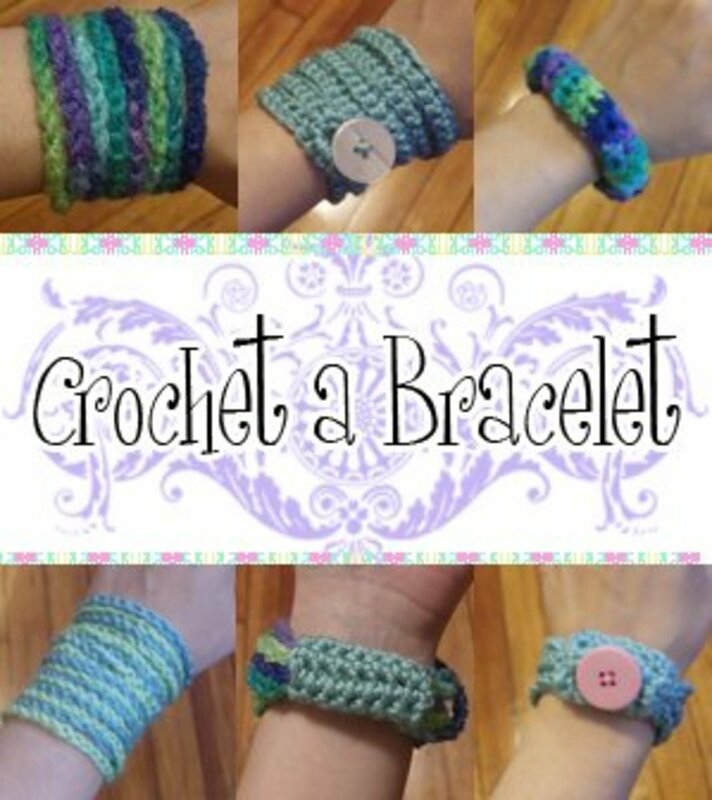 Why make your own crocheted dishcloths? 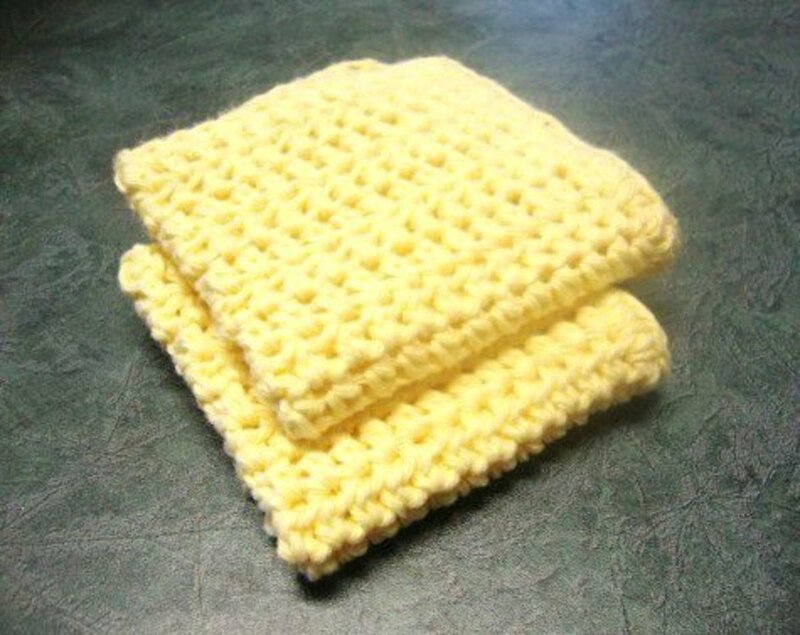 Handmade dishcloths are sturdy and absorbent. Many who use handmade dishcloths actually prefer them for the great job they do of kitchen clean-up. They are more absorbent than standard dishcloths and stand up well to wear. The dishcloths seen here can be crocheted in record time and are perfect for the practical crocheter. When you don't care about looks and are more interested in serviceability, these cloths make the grade. 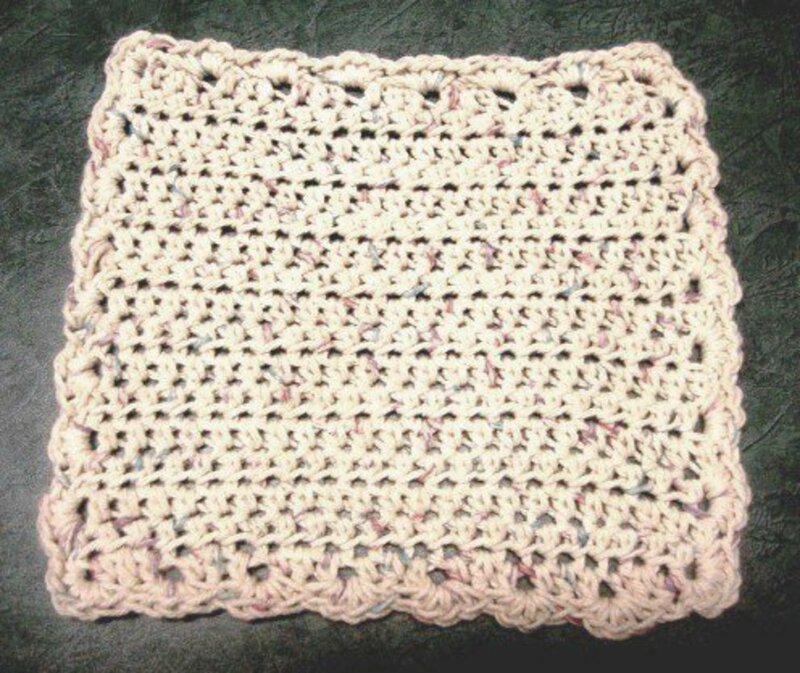 The pattern below is for a basic, no-fuss crocheted dishcloth. If you aren't a knitter or you prefer the texture of crocheted cloths, this tutorial can help you to make your own crocheted dishcloths. This cloth is worked in half double crochet stitch, which creates texture (good for scrubbing) and the edging is worked in single crochet. 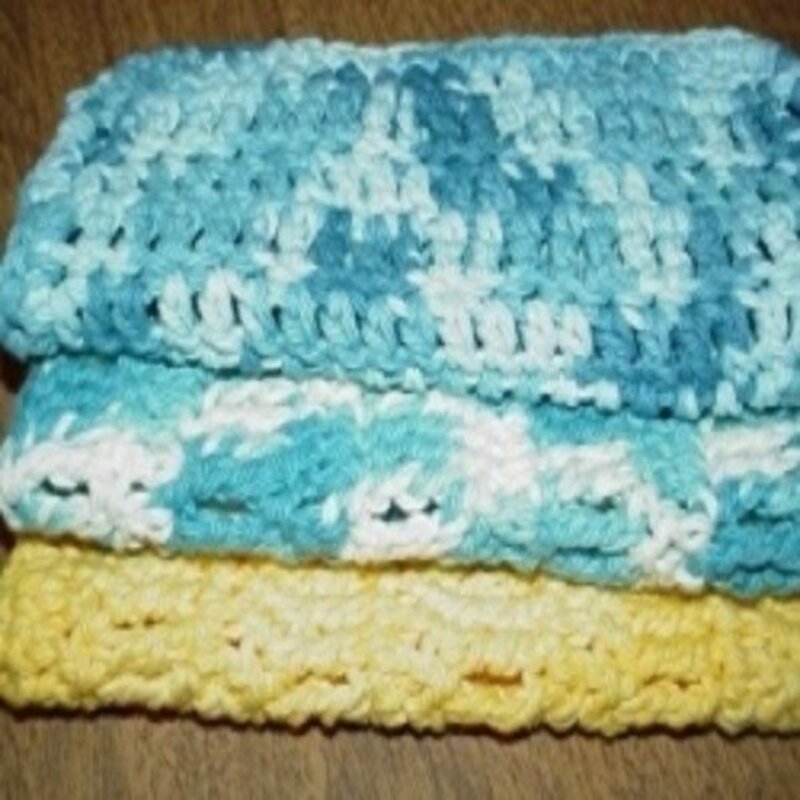 Nothing could be easier and if you want basic dishcloths, made with simple stitches, that can be whipped up in one sitting, this pattern may be to your liking. Pick your favorite colors of kitchen cotton and you are set to curl up of an evening and work on these "no-nonsense" dishcloths that even your stern grandmother would approve of. If you don't care for fancy, you can quickly make good serviceable dishcloths that will stand you in good stead for your kitchen cleaning tasks. Crocheting is faster than knitting, so if you plan on making a number of dishcloths, it's an ideal medium to quickly and easily make dishcloths, without having to worry about dropped stitches or fancy edgings. When I first tried my hand at making crocheted dishcloths, I mistakenly used regular yarn. I found to my dismay, that my newly made cloths did not "act" like "obedient" dishcloths. In fact, those little saboteurs stubbornly refused to absorb liquid and merely smeared water over my counter, and thus, I was left with a worse mess than when I started wiping! My hoped-for dishcloths were clearly not up to the task and I wondered if I needed to knit the darn things to achieve the magic absorbency. I was left scratching my head, knowing that somewhere along the line, I had missed something important. I discussed this problem with the saleslady in the craft section of a department store and mentioned that my crocheted dishcloths did not perform as expected and had been, in fact, a complete and utter bomb. This wise lady suggested that for knitted or crocheted dishcloths, one had to use the correct cotton yarn. Kitchen cotton or Handicrafter cotton, she said. Huh! Slap me silly, that was a new one to me. She directed me to the cotton section and sure enough, I saw balls of crochet cotton with dishcloths peeking from the front labels. While still somewhat skeptical, I purchased a large ball of "dishcloth yarn." I noticed that it had a thread-like quality and was less fuzzy than standard acrylic yarn. That got me thinking about my doilies. Anyone who is familiar with doilies made from cotton thread knows that when they get wet, they are very absorbent. Hmm... maybe the saleslady was on to something after all. It's a good bet that even Marilla (Anne of Green Gables) would have liked these. Row 1: Chain 25, ch 2 (forms first Hdc). Row 2: Hdc in third stitch from hook and work across row. Count to ensure that you have 25 stitches. Ch 2 turn. Rows 3-16: Continue working hdc in each stitch across each row, ch 2 at end of each row before turning to work next row. Row 17: Check to make sure that beginning tail of thread is on your left. Work across final row. Edging: Do not turn dishcloth, rather, continue around outer edge sc in each opening and using 2 sc in corners (if "dishing" occurs: 1 sc, ch 1, 1 sc in corners). Finish off with ss in end. Incorporate thread ends on back side of dishcloth. While you can weave your end in, if you have the patience, it is far better to sew it in, to prevent later unraveling. If you haven't worked hdc in awhile and need to refresh your memory, see the video below. 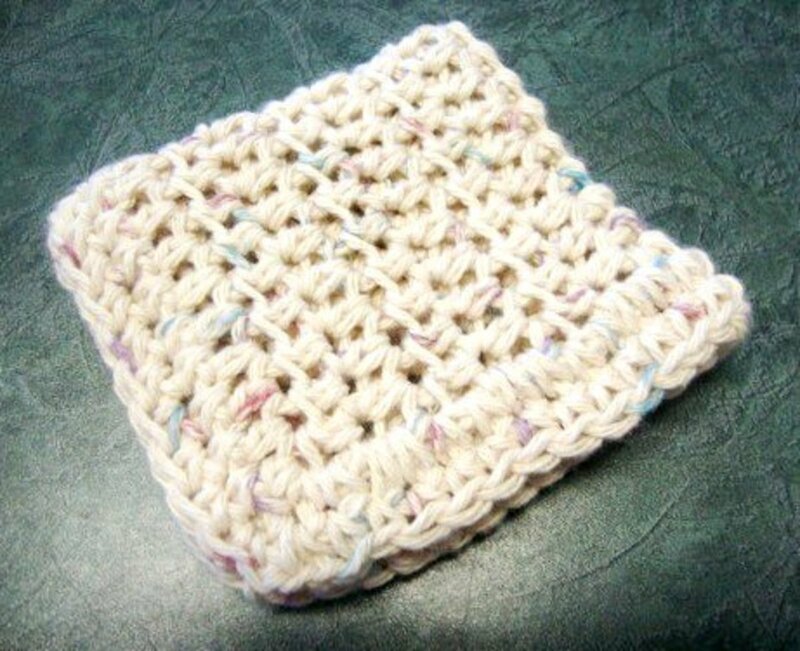 With the cost of crafting materials climbing, making dishcloths is a good way to use up your left-overs. The video shows placing your hook through a chain and hence under one loop. Because you will be working around the edge of your dishcloth, the edge will be different, and you can work your sc under 2-3 strands, so your edging is sturdy. The main thing is to sc in openings in an even fashion around the edge. Once you do one cloth you will notice a pattern of openings around the edges, which makes adding an edging easier. • For a denser cloth, use a smaller hook. • If you plan on making lots of dishcloths, a large cone of cotton can be a godsend. If you prefer to use a larger SIZE 5 HOOK, simply work 20 hdcs across row and edge twice in sc. You will see how I have done this for this same dishcloth in variegated cotton. Because this dishcloth is slightly smaller, work fewer horizontal rows--about 15 rows to make it into a square. Crochet two rows of sc around edge and finish off (2 sc in each corner on first round and sc in each stitch all the way around on second round). Check that corners stay flat. If dishing occurs, add 1 ch between sc on corners on last row of edging. Because each person's tension differs, small adjustments may be necessary. I admit it, I am rather ugly, but dishes like me. "Even with two rows of single crochet for edging, I'm still as plain as powder--but hey... the counters love how well I clean 'em." When you make a crocheted dishcloth, you do not have to edge it, necessarily; however, adding a row or two of edging will help your dishcloth stand up to wear and gives it a finished look. A fancier edging could easily be added to make these cloths look more attractive. 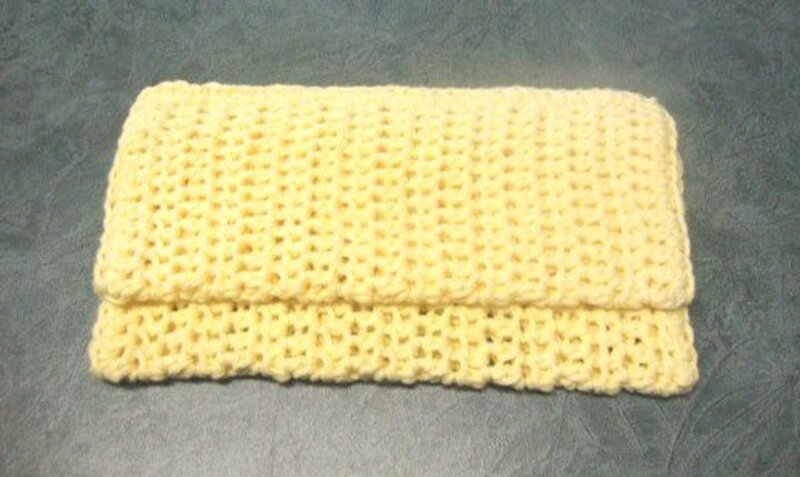 Each crafting method can be used to produce homemade dishcloths. Some people prefer crocheted over knitted and vice versa. Both methods differ and different stitches can be used to produce either smoother or more textured cloth. You get to choose your colors and experiment with sizes, instead of settling for what is available in store-bought cloths. This way, you can produce dishcloths that better fit your preferences and needs. Here in Canada, the plastic hooks come in size 4. You can match a similar hook to your yarn, simply by trying to see how they work together. The pink hook in the video, I can't comment about because this isn't my video. 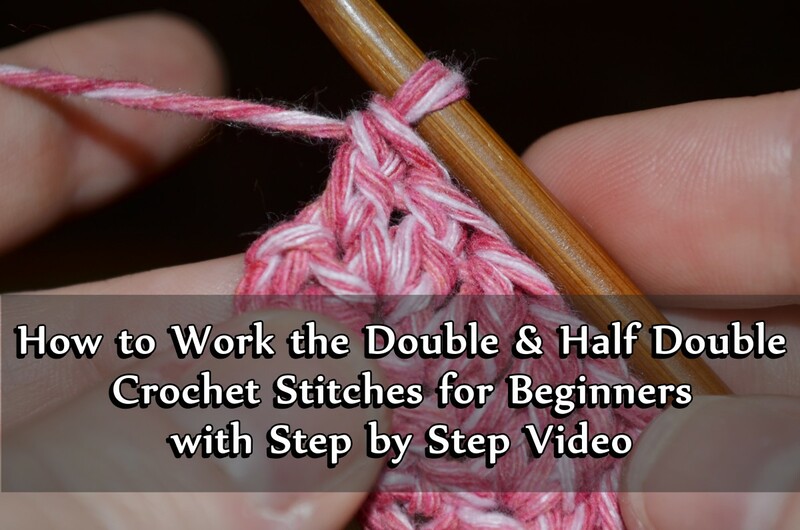 It has been included to demonstrate how to execute the stitches used in the pattern. Hi Terry, I want to order some scrubby yarn for my little yarn shop. Looks to be a great idea. I have crocheted and knitted washclothes. I agree they are great and nowadays they have a scrubby yarnyou can use, very course great for pots and pans. 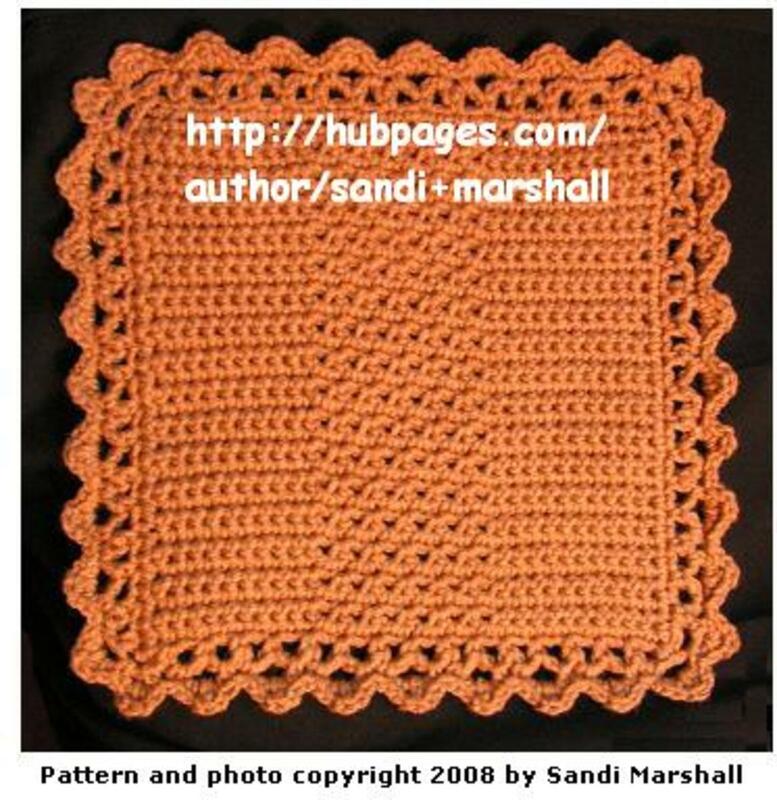 I've made many variations in crocheting dishclothes., but only two patterns for knitting...1 straight knit with peaches and cream or sugar and cream yarn...small skein probably yeild 4sm -med size dishcloths...as knitting with straight size 3 needle. Your chose as the size mine 4"square. My favorite is corner to corner knit..sz 3straight needle..only three stitches to do knit..increase...decrease. Make slip knot on your finger..put on the needle...each row increasing by one to desired size you prefer. Decrease to finish...Simple knit 2 together...last stitch bind off tuck in loose ends....I do this in beginning but its thick and cumbersome not too easy for beginners. Really easy fun knit project...which works fir me as I'm a crocheter at heart only learned to knit Christmas 2015...Creating is only as much fun as you let it be. I love crocheting but I am Ko learning to love knitting thru practice and patience and do overs...take it out and do over. I like using crocheted dish cloths. A friend gives me some but I will try making some myself. Thanks for sharing this. Hi Kim, I can't wait to pick up more kitchen cotton and make more of these. Thanks..I made some dishcloths for my sister's Christmas present for her new house and she liked them. I wish I had seen this page sooner, it would have made them look better and more even. 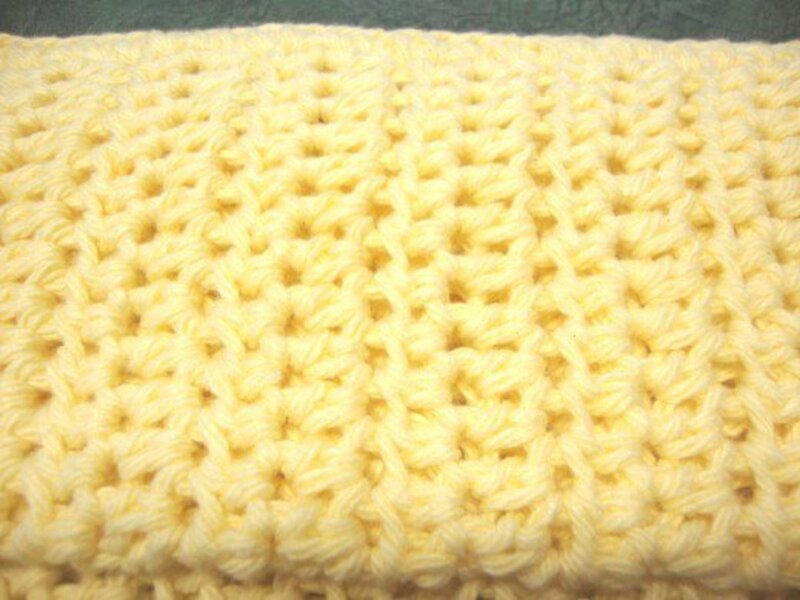 Hi BK, You can easily add scalloped edging to washcloths by adding 4 single crochet stitches and leaving a space in between. You might want to mark your washcloth with dots along the edge to estimate how many SCs. For my dishcloths, I work eight SC along the edges and double-up in the corners. You could also just work one side to see how many SC you end up with and then go from there. The hardest thing would be puncturing the washcloth. You could try a hole punch maybe. 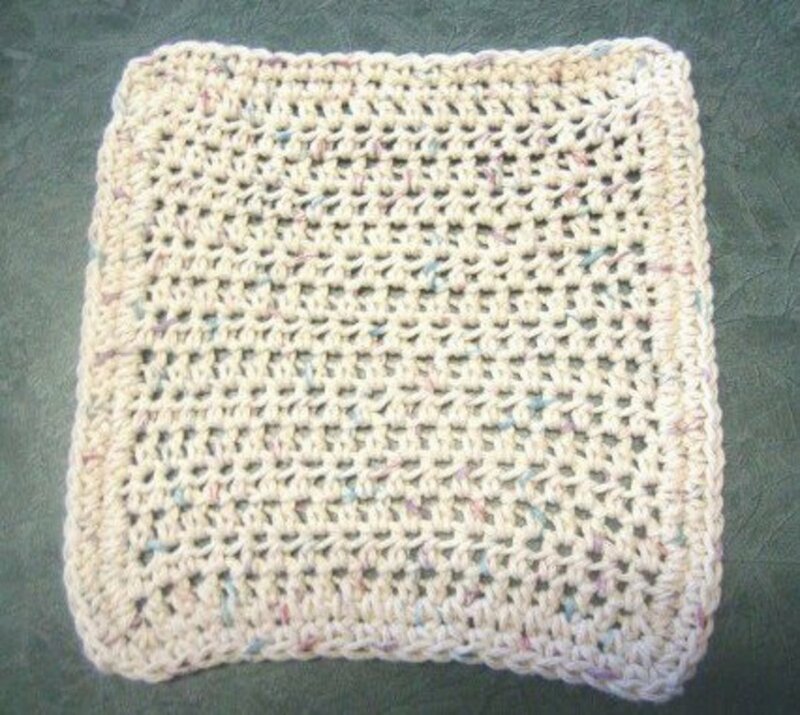 I met a lady in Florida who crocheted around a purchased bath washcloth to make a hot pad. 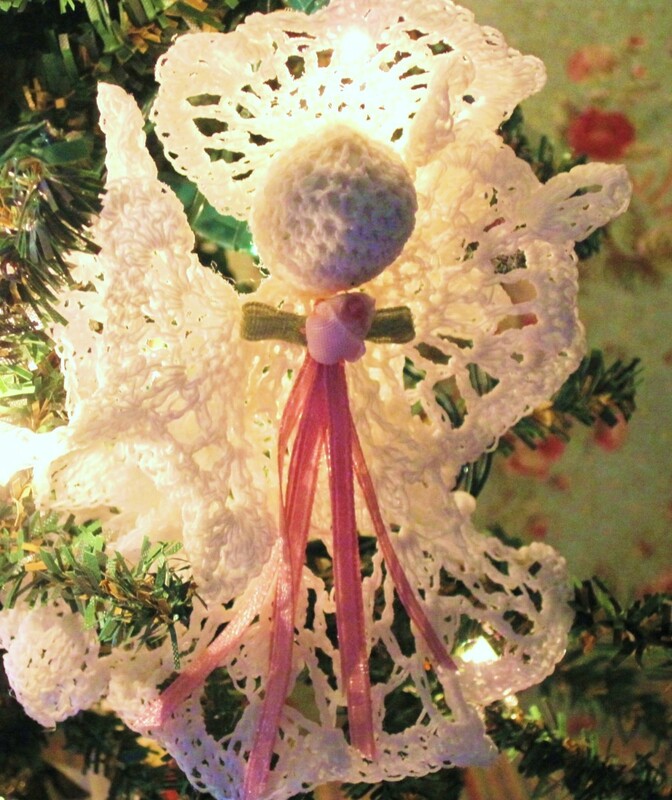 I cannot find a pattern for this and would love to make some for Christmas gifts. I don't have her address or phone number or I would contact her. Yes. hook size is whatever will work with your kitchen cotton. 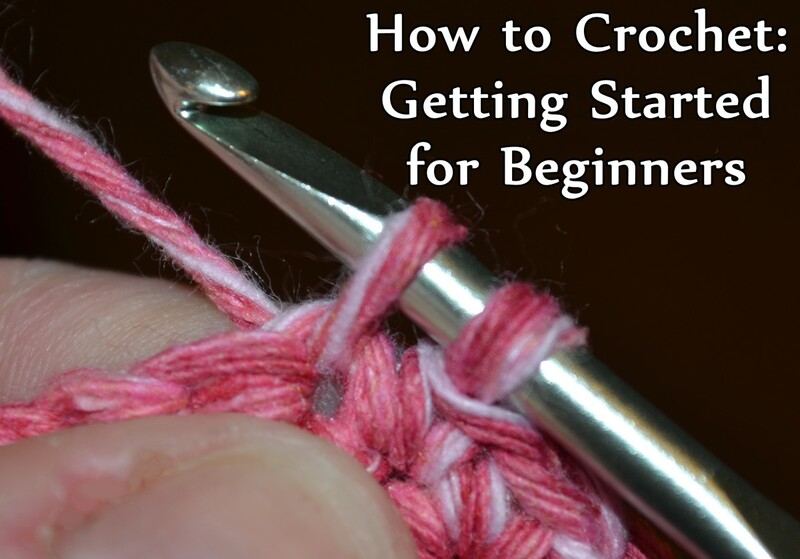 You can usually tell if it is either too big or too small by how your crochet looks as you work it. I'm "hooked" on these dishcloths! I made some for presents and mine just keep on going. I will always make them from here on in because they do such a good job of cleaning. The scalloped edges make them look so pretty, especially if you use a variegated cotton but certainly the plain are also good for everyday. Thanks for you great and appreciated comments!! Thanks Athlyn! I found similar crochet hooks that were used in the video (don't know if I can mention brands here) and used a G6 (4.00 mm) hook. It really helped me keep my gauge even. So, I finished my first dishcloth!! Thanks for the link for the scalloped edges; I'll have to try those, too! Grace and Peace to you!! I'm so impressed with how durable these cloths are and what a good job they do of scrubbing dishes and washing counters. I'll never go back to the cloth dishclothes after using these. I love this dishcloth, but have some questions. What is a size 4 crochet hook (in millimeters or letter size) and what brand is that lovely pink hook you are using? It looks more functional and balanced than the one I have. I shared this with my crochet group. Nice pattern. I'm going to give this a try! Thanks for sharing this Hub! My first crochet dishcloths were a disaster because I used yarn. It never occurred to me that yarn did not have the right absorbency. I finally found out about kitchen cotton or dishcloth cotton and have been happily producing dishcloths that do the trick in both absorbing and cleaning. I also use this pattern and work scallops around the edge for a prettier-looking cloth. 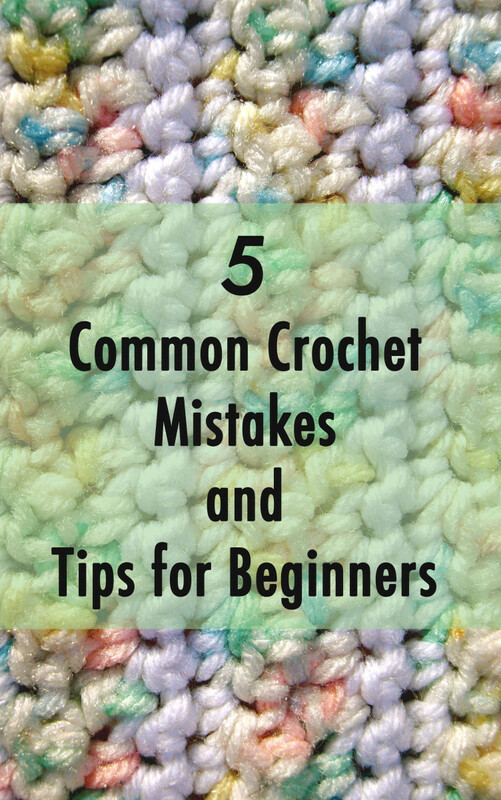 Once you've used crocheted dishcloths, you never want to go back to the store-bought variety. The homemade cloths do such a better job of cleaning. I'll have to try the size three. Good tip. Nice article. I have been making my own wash cloths and dishcloths for years. I love using them. I mostly make my dishcloths from crochet thread, two strands held together because my kids are just learning to wash dishes and have a hard time squeezing water out of the worsted weight cloths. Also, I find the thread to be scrubbier. For washcloths, I like the size 3 which is softer than size 10. Thanks for a nice simple pattern that can be worked up quickly. Thanks for stopping by! I made a number of these crocheted dishcloths for gifts this year and a bunch for myself. They really do a good job of cleaning and seem to "scrub" counters better than other material.